Out of sight, out of mind, or so the old adage goes. Say goodbye to items that have outlived their usefulness to keep clutter in check. But you can go on dumping the excess of daily life into drawers, piling it in the basement, or tossing it in a box for only so long. Sooner or later, the drawers will get stuck, the basement walkway will disappear, the box will overflow. And the already space-crunched surfaces in your home will be teeming with stuff. What's the solution? Begin by clearing out what you can, finding a place for what's left, and creating a system for organizing the new things that come through your doors. That's the secret to an organized home. Have I used or enjoyed this item recently? Does someone in the family attach personal value to it? Would I save it if my house were burning down? Will I need it in the future? If you've answered "no" to all of these questions, congratulate yourself. 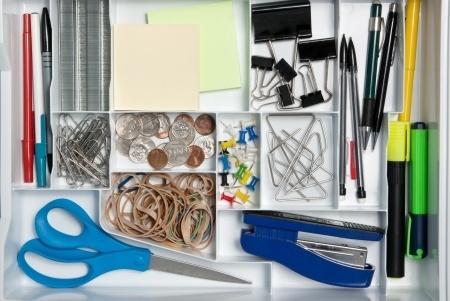 You've identified something you can eliminate in order to create an organized home..
Where should you begin? Wherever the results will have the most visible impact. If you normally enter your home through the living room, tackle that room first. If you come in through the garage, kitchen, or dining room, begin your job there. Start by bringing five boxes or plastic lawn-and-leaf bags into the first room or entrance area. Fill one container with items that belong in other rooms, a second with items you can give away, a third with items to be stored, the fourth with the items you plan to toss out or recycle, and the fifth with all those things you want to include in your next garage sale. Go around the room or target area, starting from the highest point and working your way to the floor. Give each item you encounter - furniture, pictures on the wall, and items tucked in cabinets and drawers - careful consideration as to its usefulness or sentimental value to you and your family. If you can bear to live without the item, put it in the proper box or bag. Make a list of any large furnishings to be removed or relocated. When your boxes or bags are brimming or you've given the area a thorough once-over, return displaced items to their proper rooms. Recycle or toss broken or unusable items. If you're going the garage sale route, check your calendar for a good Saturday or Sunday in the weeks ahead and set a specific date. Transfer the items you'll be storing into sturdy moving boxes. Label each container so you won't have to open it later to figure out what is inside. Put the ones containing items you probably won't need this year or next in the least accessible spots, and stow those boxes with items you may need in the months ahead in the most reachable places. As your walls and floors begin to reappear, take a good look around the room and consider how to organize the keepers. Items should take up residence where they are most convenient for you instead of where they are traditionally kept. Store like items and those that are used together - together. Store batteries in the family room or the bedrooms where the kids' toys are, instead of in a kitchen drawer. Stash items that are normally used together - such as holiday decorations - in the same place rather than scattered in closets throughout your home. And why keep summer shorts and winter skiwear in the same box? You'll probably never use them both at the same time. Obvious, yes, but as you discover more logical solutions, you may realize that you've been doing things the hard way until now. For those treasures that are meant to be seen, there are ways to display them attractively and compactly. For those you don't want on view, a clever hiding place is best. Collections of small, decorative objects require a bit of togetherness to give them a bigger impact in the room - and to free up more precious space. Group items with a similar color, texture, shape, or theme together on tabletops or shelves rather than scattered about the room. Control tabletop turmoil by corralling the smallest items in interesting containers, baskets, or boxes, where they'll make a stronger statement. Congratulations on your organized home, where you can now find what you need in minutes.